Le Corbusier and Lucien Hervé both chose pseudonyms for their professional careers (LC’s real name was Charles-Édouard Jeanneret and Hervé’s birth name was Lásló Elkan). The two forged a decades-long partnership — LC designing and building his works of wonder whilst Hervé documented it all. Lucien Hervé died on 26 June 2007 in his 97th year. He was born in Hungary— like so many of the 20th century’s great photographers (see box below) — on 7 August 1910 and arrived in Paris in 1929. Hervé was active in the French Communist Party and worked as a photojournalist during the Second World War. He was captured and sent to the Hohenstein prisoner of war camp, from which he escaped in 1940. He then joined the Resistance and changed his name. His career took a decisive turn in 1949 when he met the Reverend Father Marie-Alain Couturier who introduced him to Matisse and advised him to go to Marseilles to experience Le Corbusier’s Unité d’Habitation, then nearing completion. TOP > Unité d’Habitation, Marseille, 1949; 6 x 6 negative BELOW > Unité d’Habitation, 1952; cropped 6 x 6 negative. Hervé was astounded by what he saw and took more than 600 photos of the housing-of-the-future project. He sent a selection of his images to the architect who responded: “You have an architect’s soul and you know how to look at architecture.” Their relationship lasted until Corbusier’s death by drowning in 1965. Lucien Hervé was one of the world’s greatest architectural photographers. Other than his oeuvre documenting LC’s life, he photographed the works of Alvar Aalto, Marcel Breuer, Kenzo Tange, Richard Neutra, Oscar Niemeyer, and Jean Prouvé, among others. He is, I think, the Julius Schulman of France. 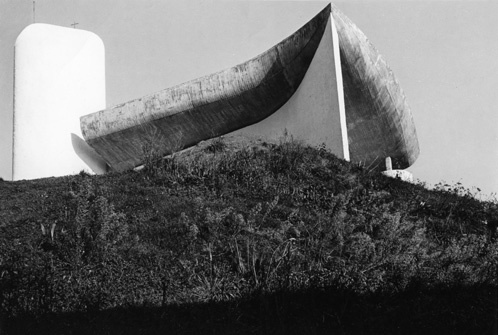 He is known especially for his images of Corbusier’s planned city, Chandigarh, and Niemeyer’s City of the Future, Brasília. Received your program. I hope to read your . . . made here . . . a real creative work. It’s really beautiful. Very beautiful to have seen, then chosen the link and the time (or theme? ), then to have realised it. My warmest congratulations on it. It’s not about photism, it’s the photo of the highest value or worth.